Course of the Ivel The River Ivel rises just north of Baldock in Hertfordshire, but most of its course lies within Bedfordshire. 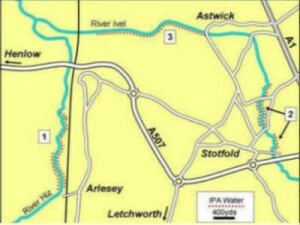 It flows through Stotfold, Arlesey, Henlow, Langford, Biggleswade, Sandy and Blunham. It joins the Great Ouse near Tempsford. The total length is about 25 km(18 miles). The Purwell and Oughton are chalk streams which join as a confluence at Ickleford in North Hertfordshire to form the River Hiz, this in turn joins the Ivel near the village of Henlow. Other tributaries are the Rivers Flit & Hit, which join in Shefford becoming the Ivel Navigation Chanel (Navigation now ceased) eventualy this joins the Ivel at Langford. The 2 most popular methods of fishing the river are using a pole or ledgering. Trotting through with a stick float or waggler can still be very effective and at one time was the chosen method of most anglers. Pole fishing on the Ivel is a very effective method as 10 metres is about all that is needed on most stretches. Chopped worm or maggot/caster can be extremely effective in putting together a chub catch. Ledgering is the popular method for chasing both the chub and Barbel with some surprises coming out like a near 3 lb roach and a 10lb bream all on pellet chasing Barbel. Baits long forgotten are bread in the winter months or even a bit of cheese may work very well. Barbel: Biggleswade Back Meadows and Common are the most heavily fished for barbel with fish being regularly caught in double figures. However there are other spots and the best advice is to go and walk the river, check it out, in truth there are Barbel all along the river. Chub: Fish to 8lbs have come out of the river and this species is common along the entire length in both shallow and deeper parts. Biggleswade Common is the most popular venue for chub but the biggest ones often come out of the deeper stretches. Silver Fish (Roach & Dace): There are good roach and dace in the river but not the numbers as in the past. 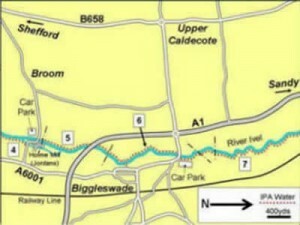 Try the upper reaches beyond Biggleswade Mill have a walk and a look; there is an old towpath along this section. 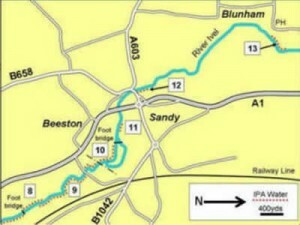 The deeper sections around Sandy New Rd Bridge are also worth a try. 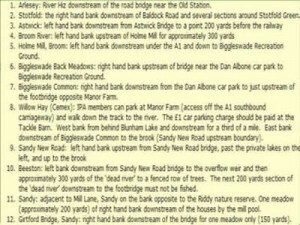 Perch: Some big fish of over 3lbs can be caught at Broom upstream left bank from the mill. These fish have got fat on signal crayfish so prepare for some silly knocks on your line. Finally try something a bit wild the IPA has a short stretch in Blunham Village you can find it on the map. Rarely fished it holds all species well worth a look.